Here's a Barrow's goldeneye I finished recently. I haven't done many diver ducks in recent years and I had fun doing this one. Here's that widgeon pair I was working on. All painted and keeled up. Here's that cedar pintail I post a couple entries back. I went out to close the garage window before I went to bed and ended up with a base-coated bird before I made it back inside. Here's a rig of wigeon and a single pintail I've got in progress. These four (3 drakes and 1 hen) are all sealed up and ready to paint. I've also got another low head hen and high head drake wigeon in the works, but they aren't really worth taking a picture of right now. 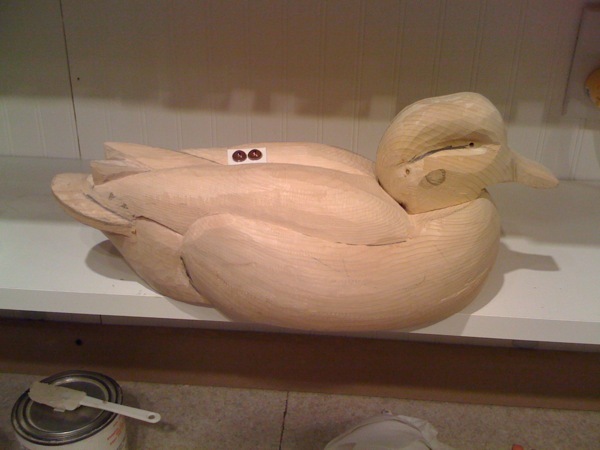 One of the drakes is carved from basswood that I've had for a while now. The others are white cedar I bought from Dwane Ong. Here's a pintail I've been casually working on as well. I'm still putting the finishing touches on the carving. It's carved of white cedar but I've inlet a piece or hard maple for the tail. I've also another hen and drake wigeon in the works, but they aren't really worth taking a picture of right now. I think I'm just about done with this wigeon. Just need to add a keel now. We're packing up the house and I haven't had too much time to spend in the shop as of late. Here's some stuff I've got in process. I was especially curious to see how mobile posting works with my new squarespace app. The wigeon is hollowed, weighted, and glued together. I sealed the insides with WEST epoxy. I also coated the primary feathers to add some toughness. It's just about ready to seal up and paint. 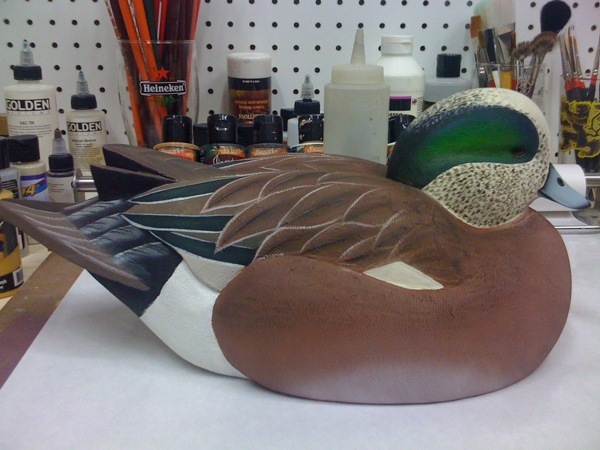 The gadwall body is pretty much carved, but the head isn't too much more than cut out. The mallard is basecoated with a little bit of detailing added to a couple areas.